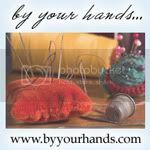 Crafts By Jodi: Online Craft Show -TODAY! Are you staying in your nice warm home and eating leftovers right now? Don't worry, you are not missing the Black Friday sales. Today, and all this weekend you can shop from home and get lots of great deals and very unique gifts! There are lots of great vendors, so make sure to check them all out. The sale starts today at 6 PM and runs thru Monday at Midnight. A member of Pattern Mart! Hi I'm from Western PA. I have been making crafts for over 20 years now. We are proud to say that all our crafts are completely hand made here in our country home. My Daughter I tell ya! I was featured on the By Your Hands Blog.